LAS VEGAS – Switch (NYSE: SWCH), the global technology infrastructure corporation that develops hyperscale data center ecosystems for enterprise colocation, elite hybrid cloud, and industry-leading connectivity solutions, today announced that it has hired Jeffery Bryce as Senior Vice President of Solutions Architecture. Switch’s initiative to attract veteran data center sales specialists to its new strategic sales team continues with the addition of Bryce. Bryce joins Switch from Level 3 Communications (CenturyLink), where he was the Director of Sales Engineering for the Level 3 Wholesale division. He developed and executed technical sales strategy and supported the growth in consulting services and solutions. Throughout Bryce’s distinguished career in telecommunications and leadership in technical sales engineering, he has held senior positions with global companies including Broadwing Communications, Winstar International, Inc and Teleport Communications Group. As Senior Vice President of Solutions Architecture for Switch, Bryce will lead the technical, operational and product development strategy for Switch CONNECT® with his new team comprised of solution architects, project managers, and operations specialists. Switch CONNECT® is the world’s only hyperscale telecom auditing cooperative that has the lowest pricing on connectivity in North America while also leveraging the footprint and reach of the leading global carriers. 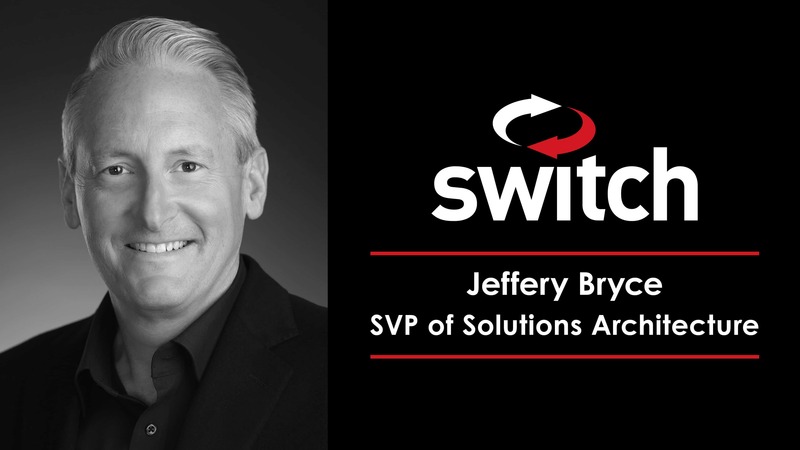 Bryce’s in-depth knowledge of global carrier service offerings and leadership in sales engineering, will help to drive revenue growth for Switch. “I am excited to apply CEO and Founder Rob Roy’s design and engineering excellence of Switch’s data centers to all aspects of the communications connectivity model and towards the advancement of Switch’s global communications capabilities,” said Switch SVP of Solutions Architecture Jeffery Bryce. The Switch PRIMES, located in Las Vegas and Tahoe Reno, Nevada; Grand Rapids, Michigan; and Atlanta, Georgia (opening in Q4 2019) are the world’s most powerful hyperscale data center campus ecosystems with low latency to major U.S. markets.